Archives : RISING GAP TO THE RESCUE - 20/06/2014. RISING GAP TO THE RESCUE – 20/06/2014. The market action for the entire week can be summed up by two words ‘Range bound’. That is precisely the way the market moved for the entire of the last week. Price Correction was the need of the hour but somehow that continues to elude the market. In bargain, the market has taken support at the strong confluence Support zone of Nifty 7497-7477 (which is a confluence of first Rising Gap and 38.2% Retracement of the immediate rise) for the entire of the last week, without breaching it. This Support zone is the key to the future market movement, i.e. the much expected Price Correction will start only if this Support zone gets breached. In that case the minimum Correction levels are placed at Nifty 7409-7340. Sensex opened the week at 25239, made a high of 25609, low of 25056 and closed the week at 25105. Thus it closed the week with a loss of 123 points. 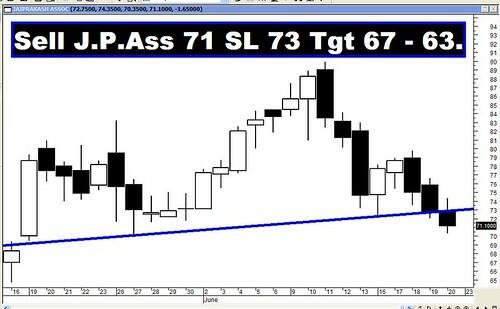 At the same time the Nifty opened the week at 7534, made a high of 7663, low of 7487 and closed the week at 7511. Thus the Nifty closed the week with a loss of 31 points. On Friday, both Sensex and Nifty formed a small black body candle in sideways consolidation phase. On the weekly chart both the indices have formed a small black body candle with long upper shadow. The long upper shadow is because of Selling witnessed at higher levels. On the weekly charts last three weeks have formed a pattern which is on the lines of Mat Hold but the key remains the formations in the coming two weeks. Thus daily as well as weekly formations point towards consolidation in the near term. Currently the market is experiencing Time wise Correction after reaching the daily as well as weekly Flag pattern target which was at 7705. But while moving higher the market has left behind two Bullish Rising Gaps out of which the first between Sensex 25129-25044 and Nifty 7497-7484 is already acting as a strong Support by supporting the market for the entire last week. In fact this gap aided by the 38.2% Retracement of the immediate Correction levels form a strong confluence Support zone between Sensex 25135-25044 and Nifty 7497-7477. Interestingly the short term average of 20dma (Sensex 25037 and Nifty 7480) also falls within the Support zone and hence if this Support zone gets breached then the Short Term Trend will turn negative. Both Sensex and Nifty are above the short term average of 20dma (Sensex – 25037 and Nifty – 7480), the medium term average of 50dma (Sensex – 23870 and Nifty – 7131) and the long term average of 200dma (Sensex – 21526 and Nifty – 6410). Thus the trend in the short term, medium term and the long term timeframe continues to remain bullish. MACD continues with its Sell signal despite being positive. RSI has reduced to 58 suggesting a reduction in bullish momentum. Besides it also exhibits negative divergence of the first order. Stochastic Oscillator continues in Sell mode as %K is below %D. MFI has reduced to 55, suggesting that the money inflow has reduced. OBV has started moving lower but is yet to give a Sell signal. The Directional Indicators continue in Buy mode as +DI is above –DI. Bollinger Band continues with its Buy signal given last month. ADX is now at a level of 52 which suggests that the strength of the current uptrend is very high but the trend is now maturing. Hence Oscillator analysis suggests remaining cautious as some correction in the current uptrend can be expected. India VIX, has started to move higher and is now around 19. One can expect a breakout if VIX closes above 22, paving the way towards a level of 28. Highest Put writing is seen at the strike of 7500 and highest Call writing is at the strike of 7700. Thus one can expect a range of the market between 7500 and 7700. On Friday, there was strong buildup in the strike of 7550 for both Calls and Puts, which suggests that the Option writers or the Strategy makers are creating Short Straddle strategy to take benefit of the remaining Time Value. For the next month highest Open interest buildup is for 8000 Call and 7300 Put. Thus for the next month series we can expect a bigger range between 7300 on the lower side and 8000 on the higher side. 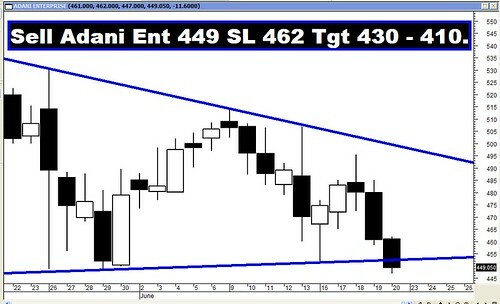 For the week ahead, Sensex will find Support at 24828-24422-24156 and will find Resistance at 25419-25735-26124. For the week ahead, Nifty will find Support at 7399-7269-7172 and will find Resistance at 7621-7742-7838.